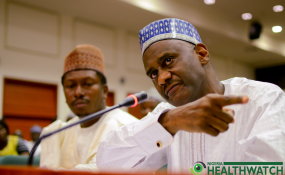 Embattled executive secretary of Nigerian Health Insurance Scheme (NHIS), Prof Usman Yusuf, has said he was sent to the commission to do God's work. Yusuf disclosed this during an exclusive chat with THE INTERVIEW magazine few hours before he was directed by the federal government to proceed on 'administrative leave'. LEADERSHIP reports that the federal government subsequently set up a seven-man panel to investigate the allegations levelled against him by the scheme's Governing Council, which led to his recent controversial suspension. When asked if the activities of NHIS crippled in the last few weeks following his controversial suspension by the governing council, he said the activities of the commission was not crippled because he has not left the NHIS. Yusuf said when on October 18 the governing council purportedly suspended him he never left his seat, as he was working while they were people protesting. "Did you see them when you came in? The protesters got tired", he told journalists from THE INTERVIEW magazine. The embattle NHIS boss described public service in Nigeria as contact sport, saying "you take the heat and the bruises and stand up and move on". He continued: "Previously it used to bother me. You have stolen this, you have stolen that. I don't use to take some papers home because my wife gets worried whenever she reads them. I don't care anymore because I am here to do God's work. And I am doing it. "Nothing has been crippled in the NHIS; work continues. We continue to pay for services of our patients out there in hospitals across all six geopolitical zones. And if they want to shake me or intimidate me, they have chosen the wrong person. I am here to do work and I will". Yusuf further noted that he has no reason in the world to be disrespectful to the Minister. He said, "He is my elder, both in age and professionally. His achievements in life are achievements I want to attain. He is my supervising minister. "We are academics. Also, we argue for the sake of patients. It doesn't mean it is personal. It has never been personal with me and my honorable minister and it continues, whether he is the minister, whether I am here or not, he will always deserve my respect".